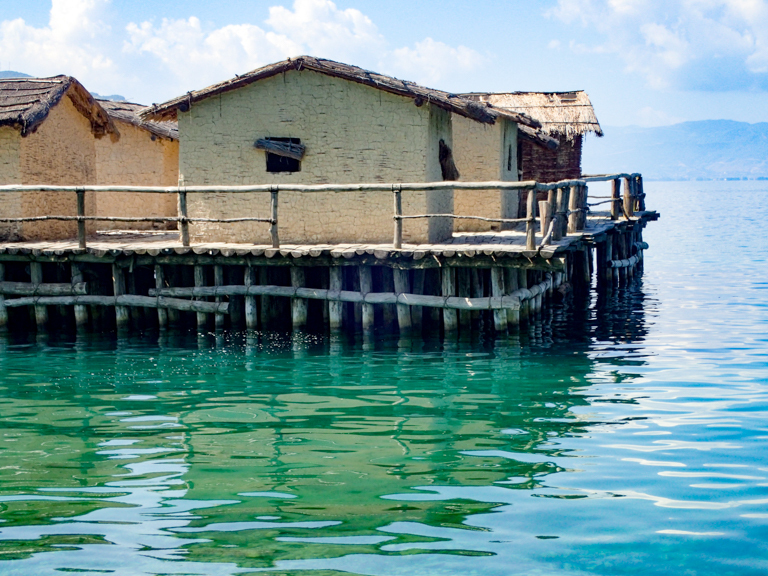 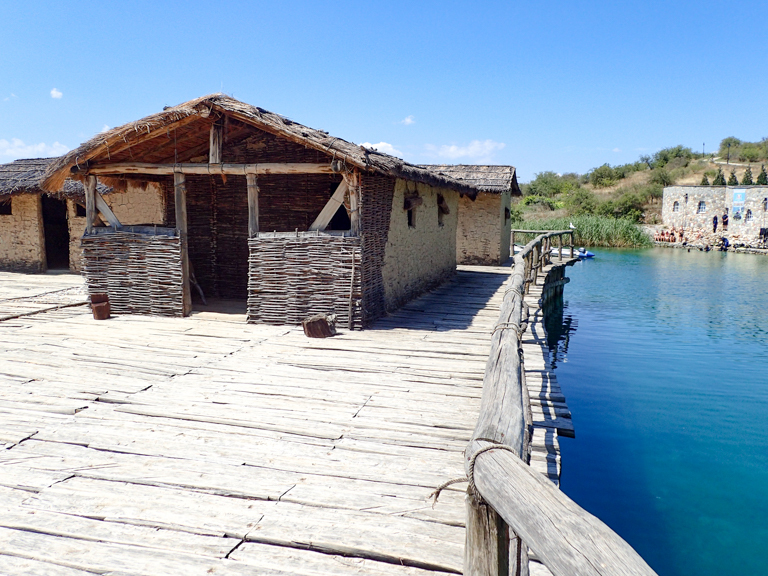 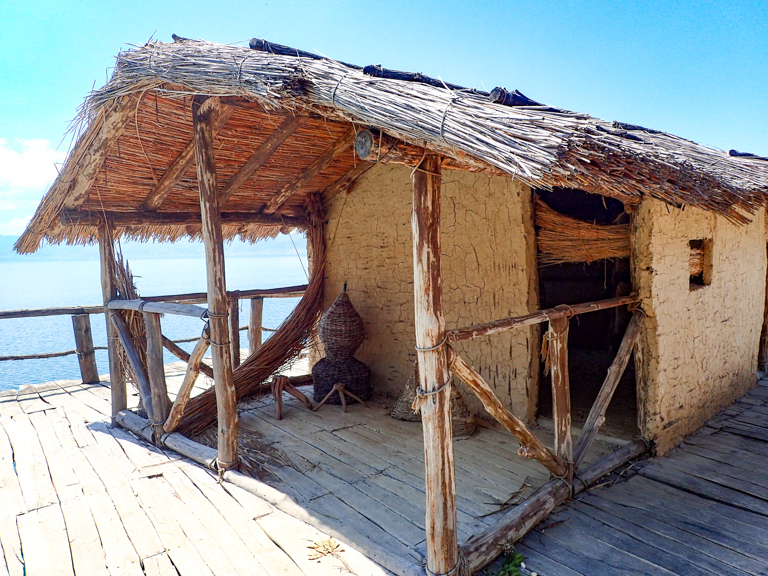 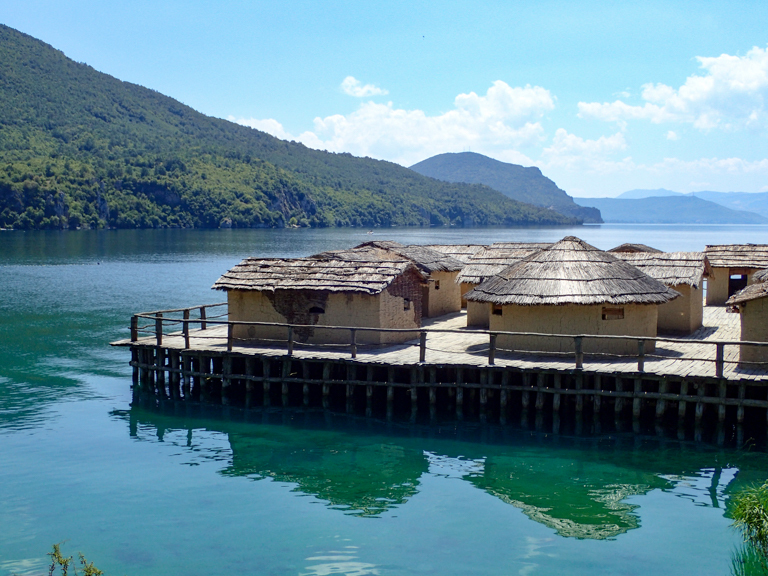 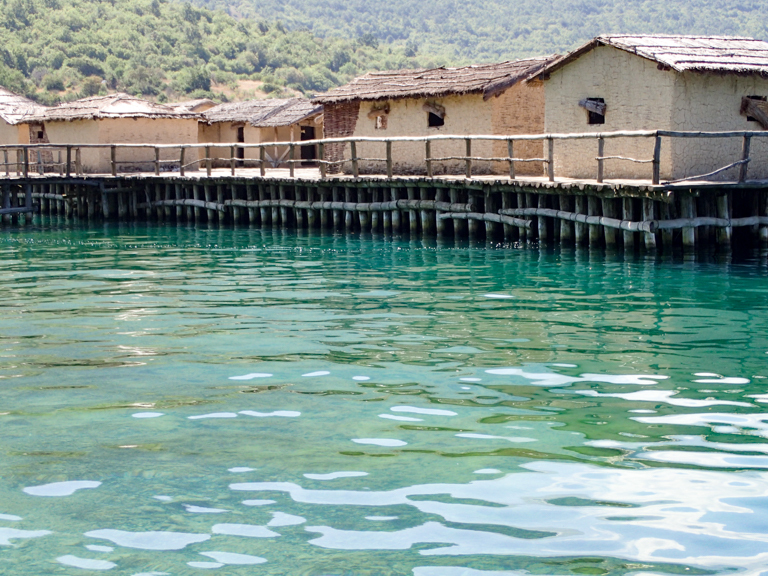 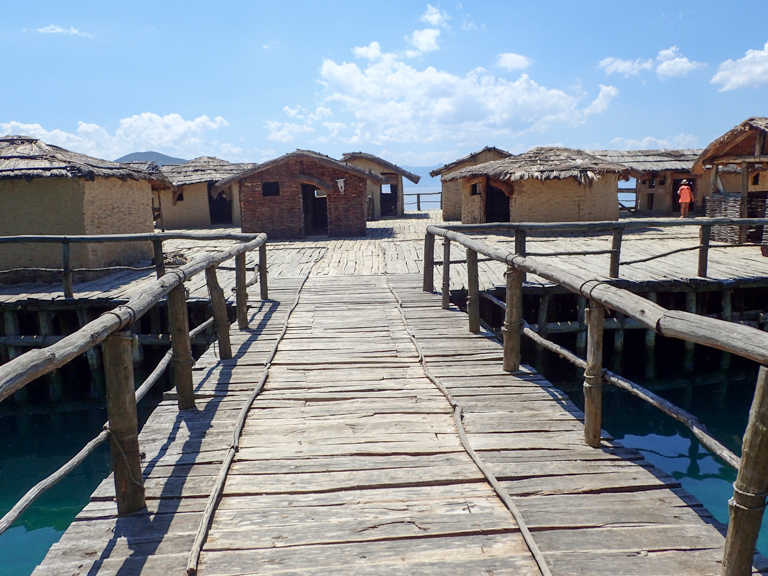 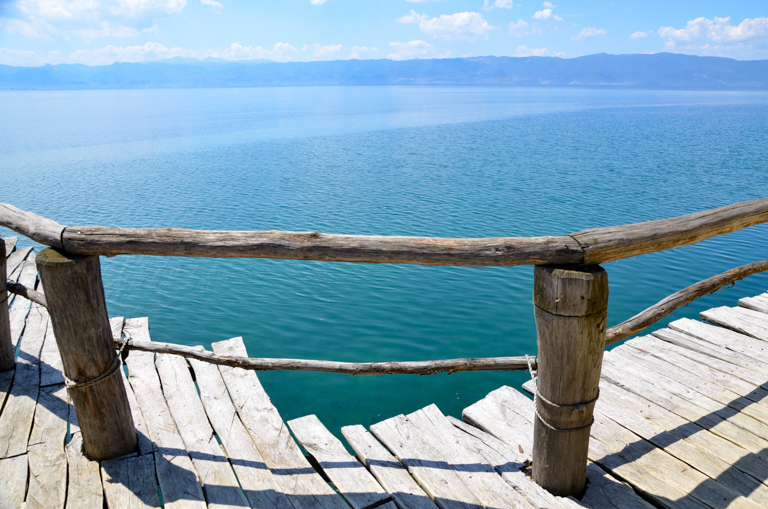 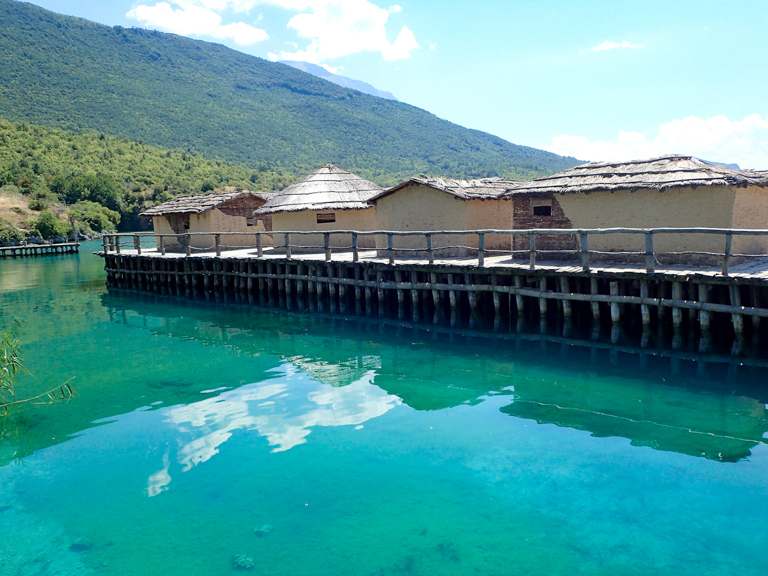 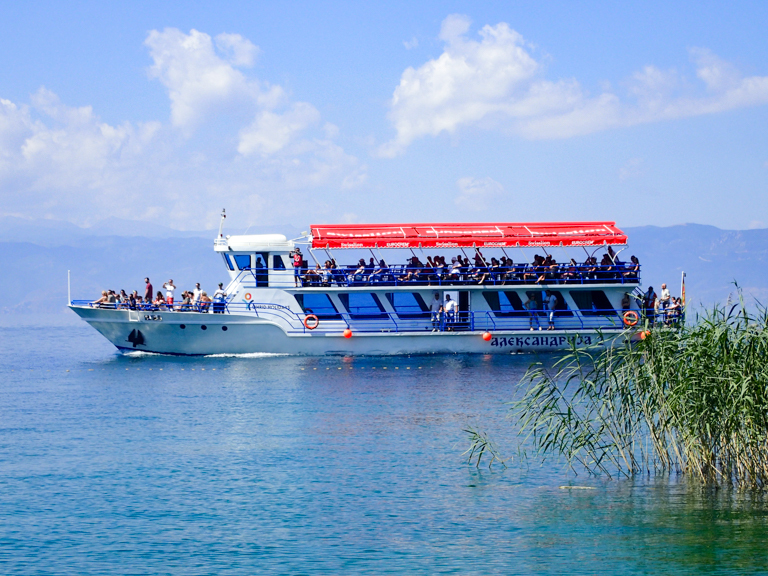 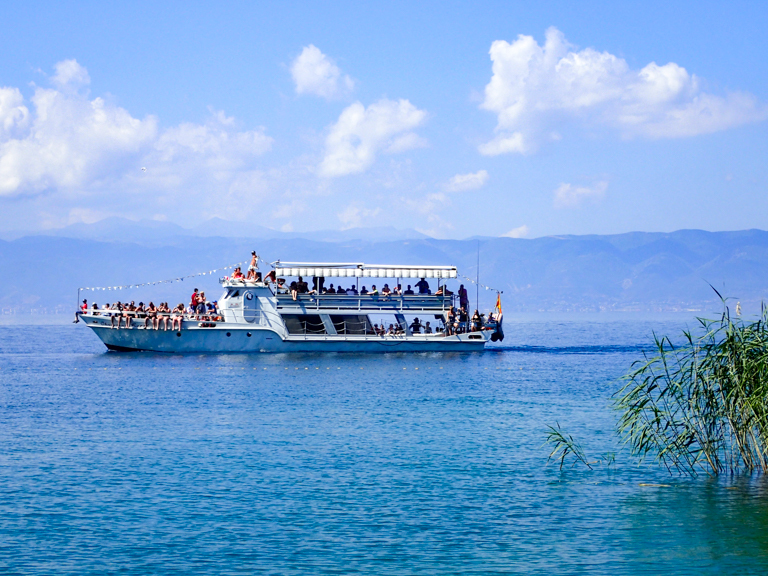 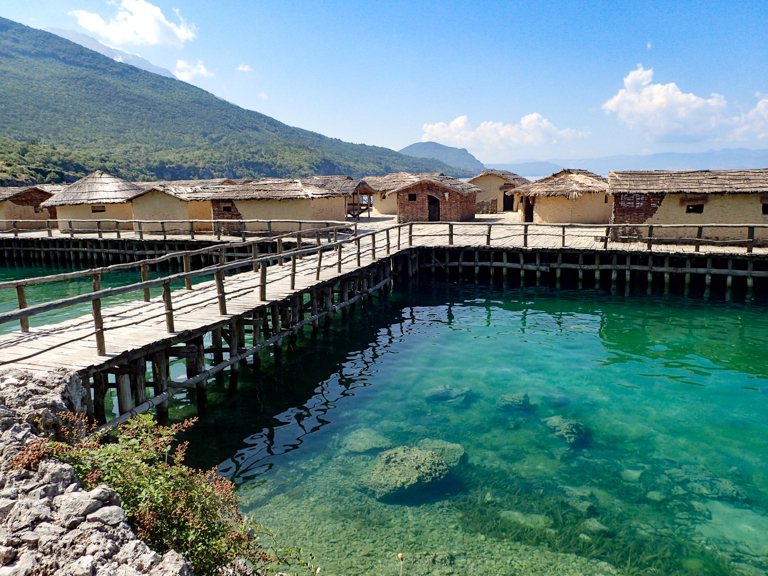 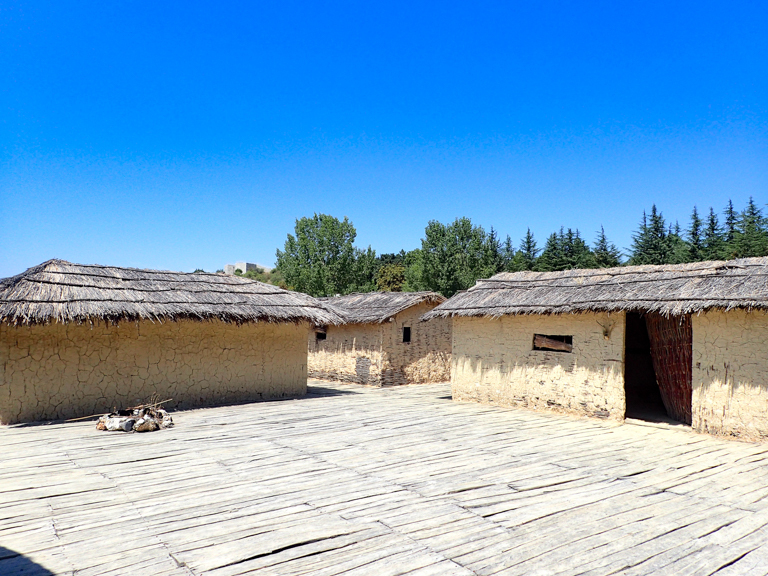 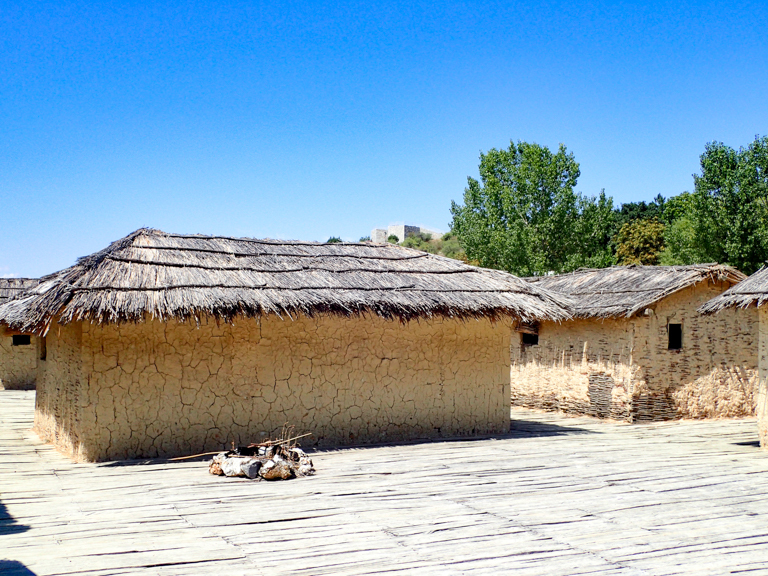 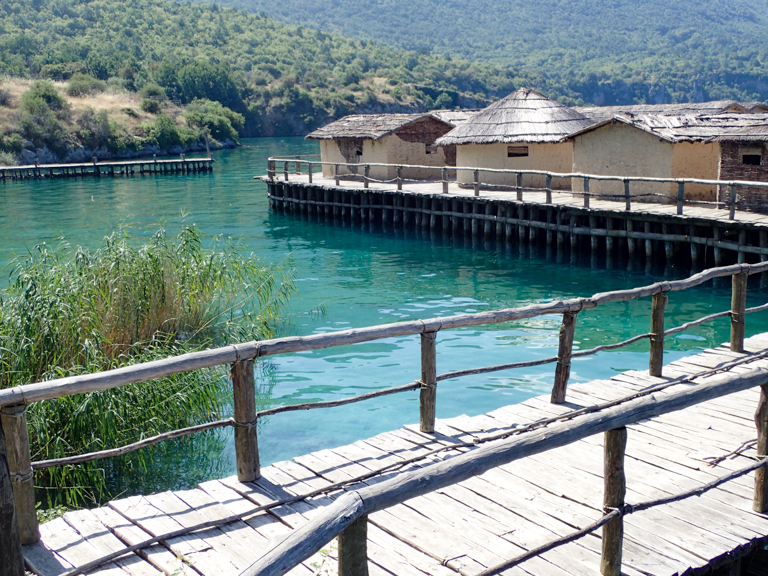 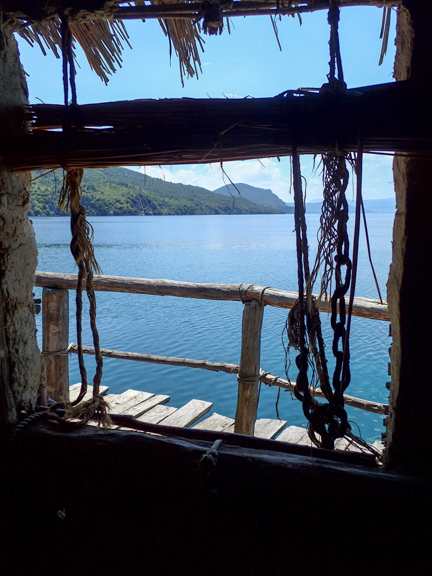 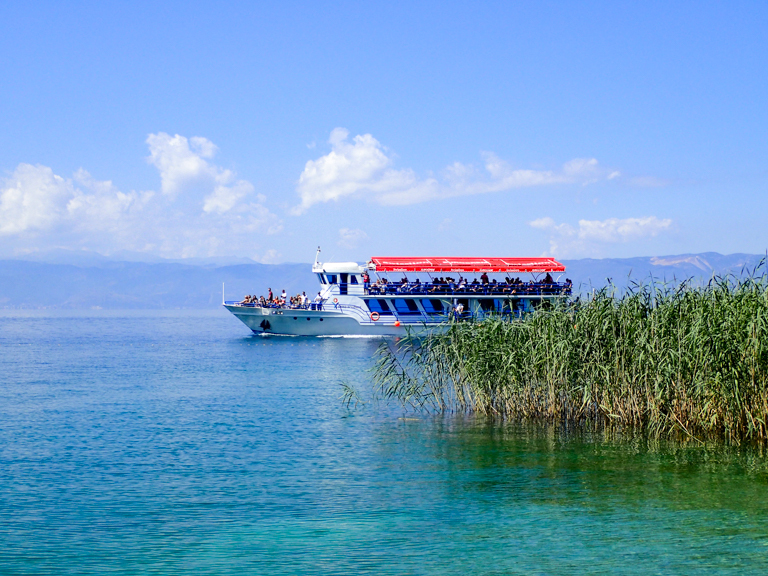 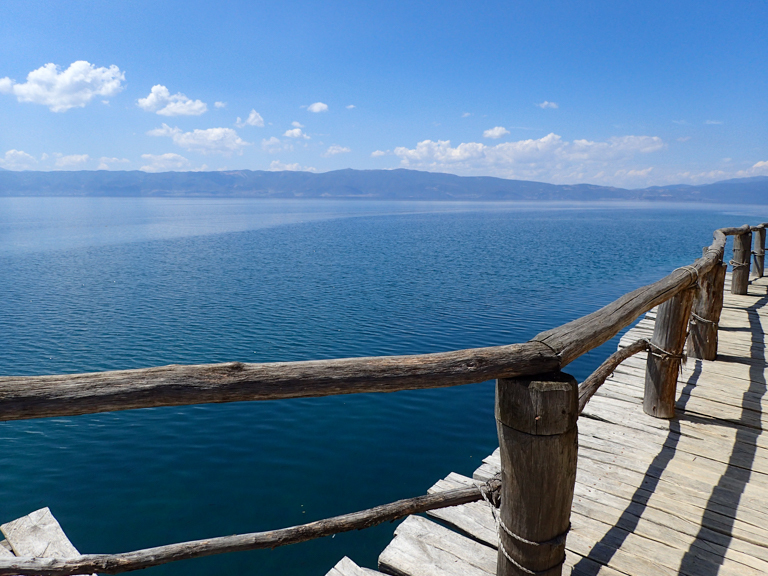 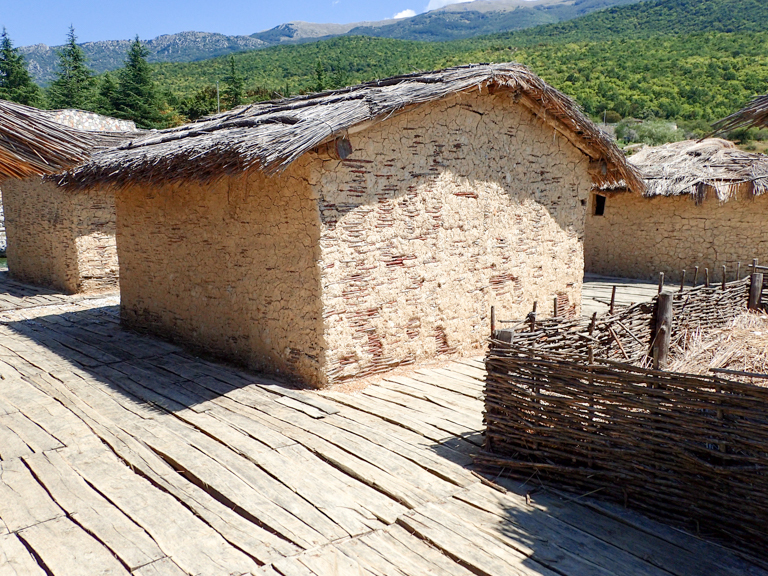 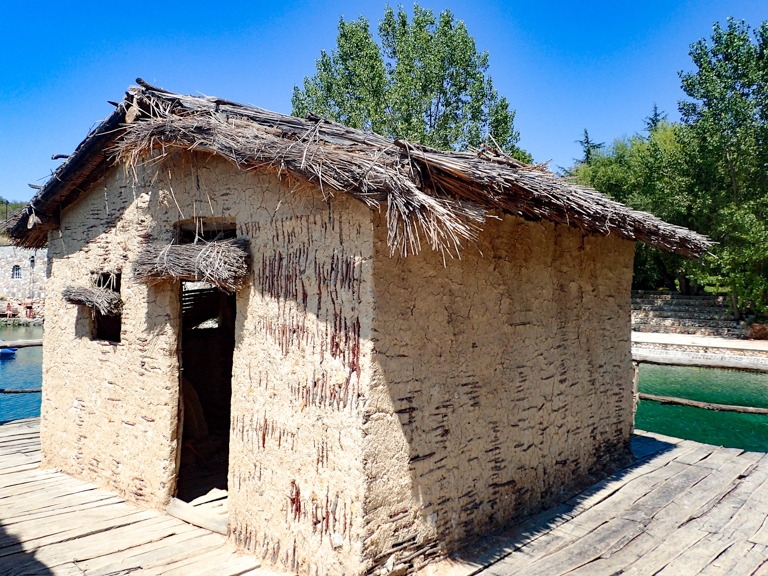 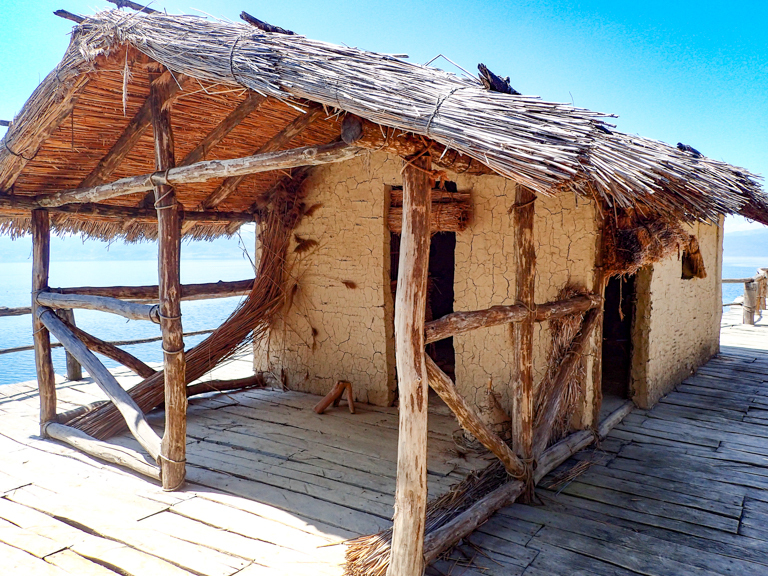 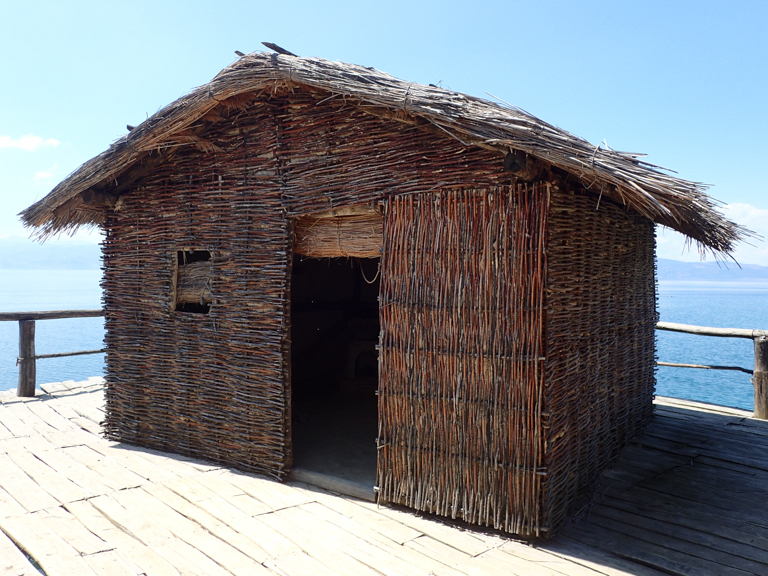 The Museum on Water, a reconstruction of a prehistoric pile dwelling settlement on the site of Plocha Mikov Grad (Плоча Миков Град), is located in the Bay of the Bones on Lake Ohrid adjacent to the Gradishte Campgrounds about two kilometers south of the village of Peshtani and 16 kilometers from the center of the City of Ohrid. 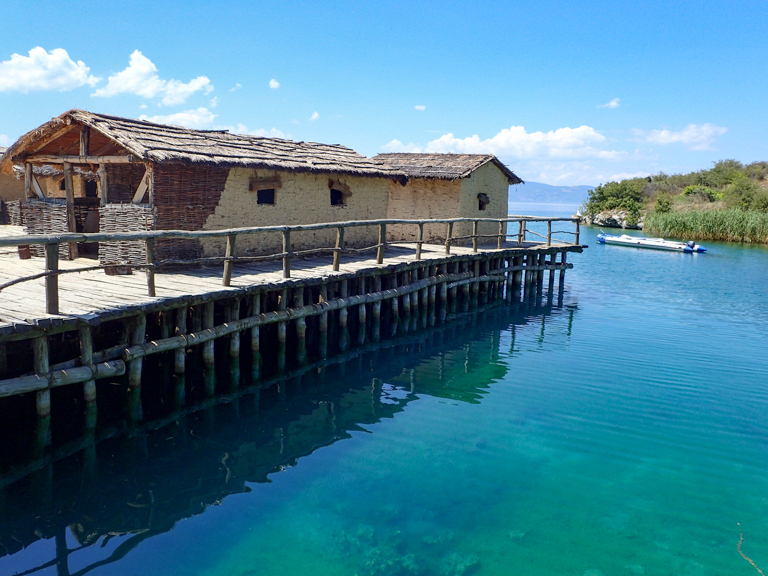 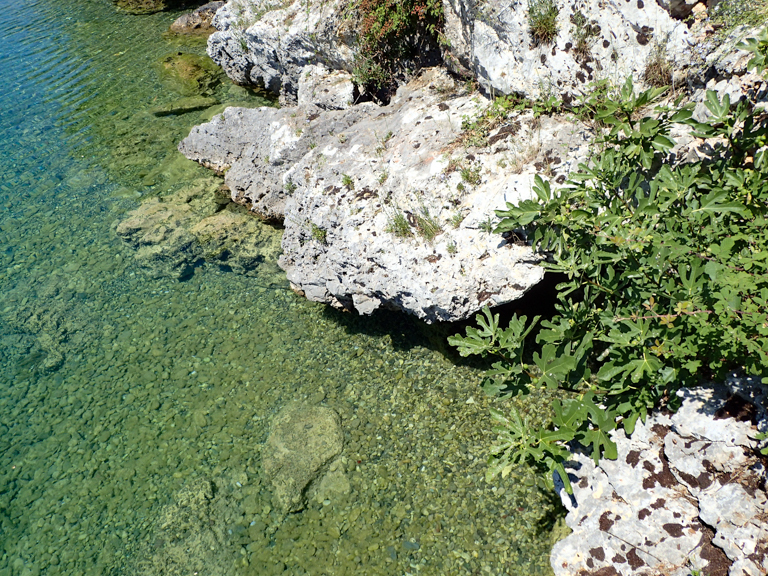 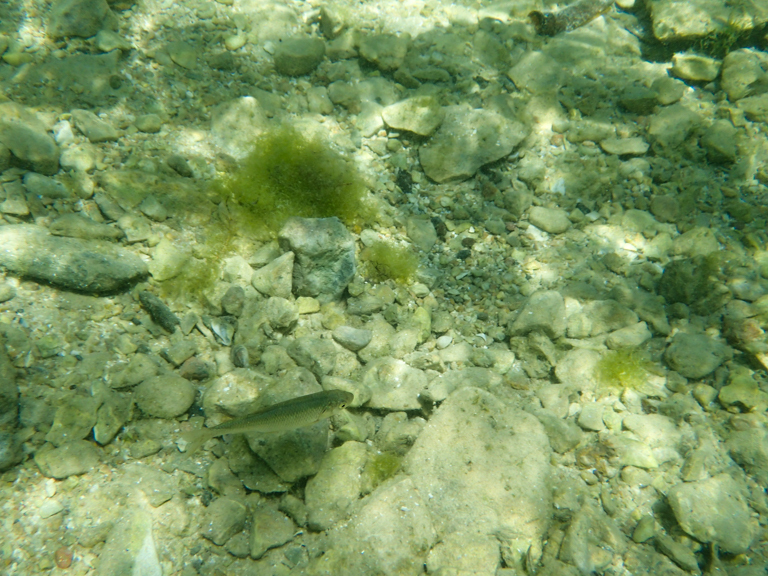 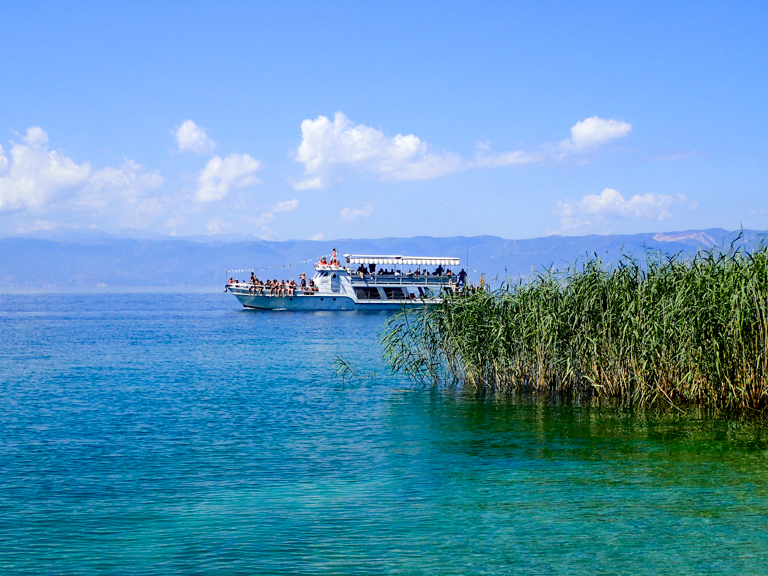 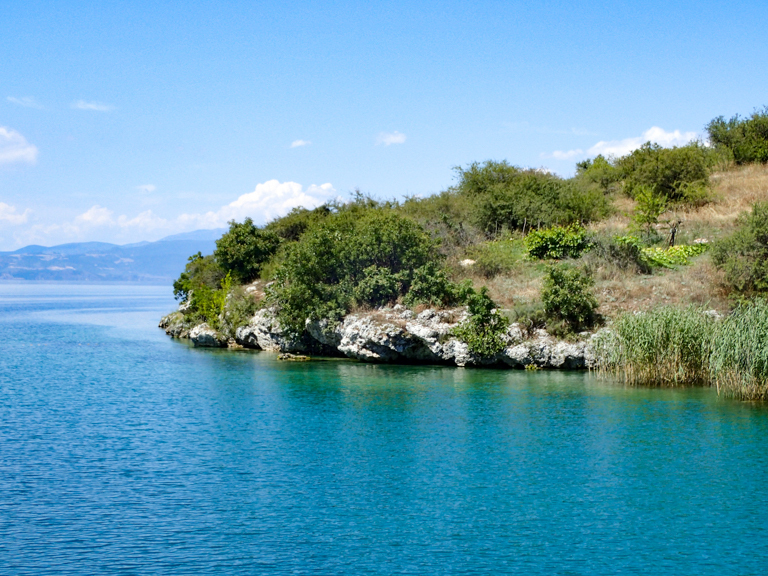 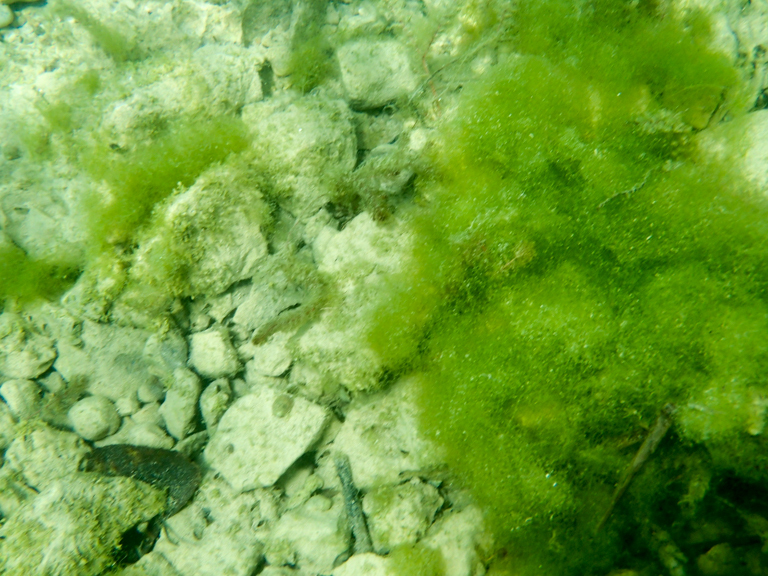 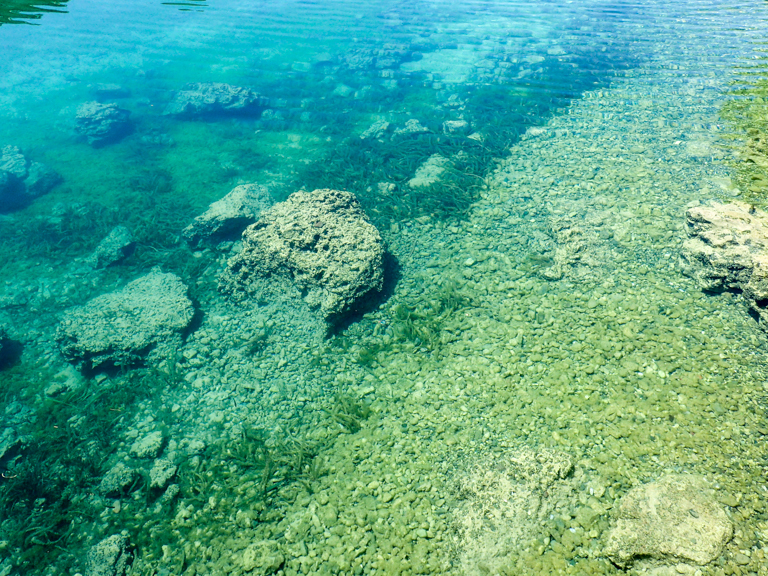 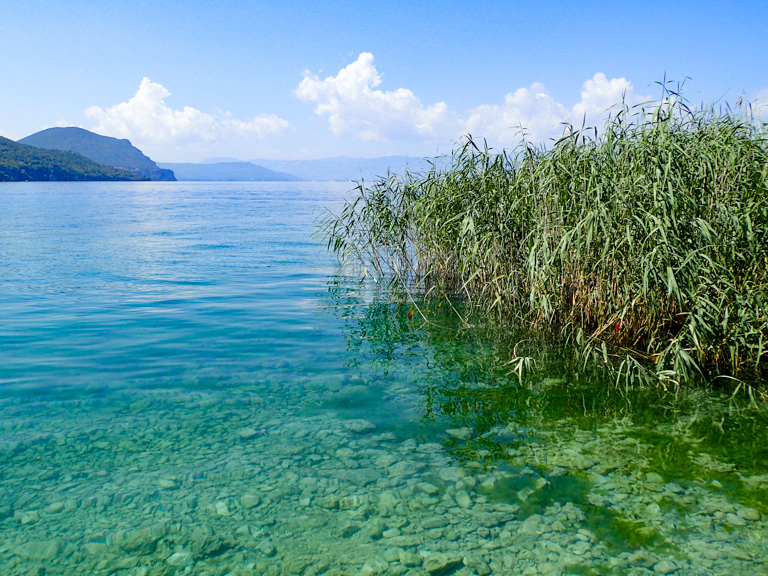 In the latter part of the 20th Century, investigative efforts further revealed the extent of pre-historic pile dwelling settlements on the eastern shore of Lake Ohrid, especially at the site called Plocha Mikov Grad in the Bay of the Bones. 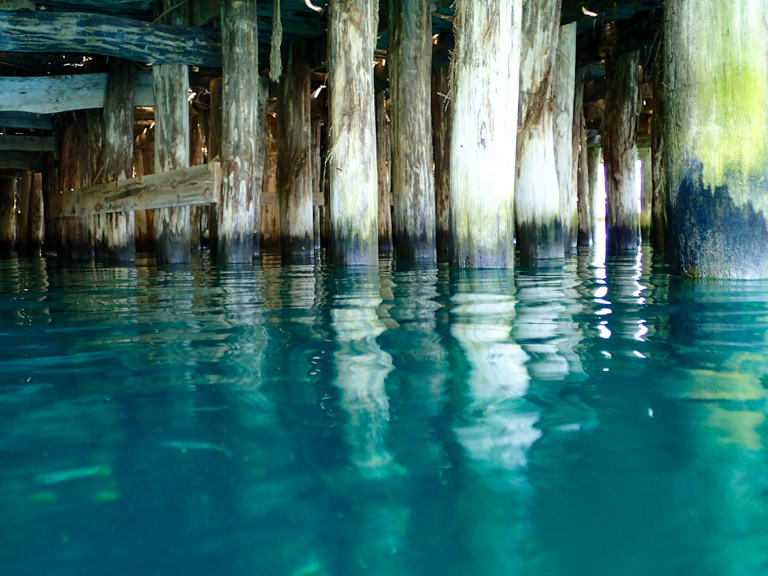 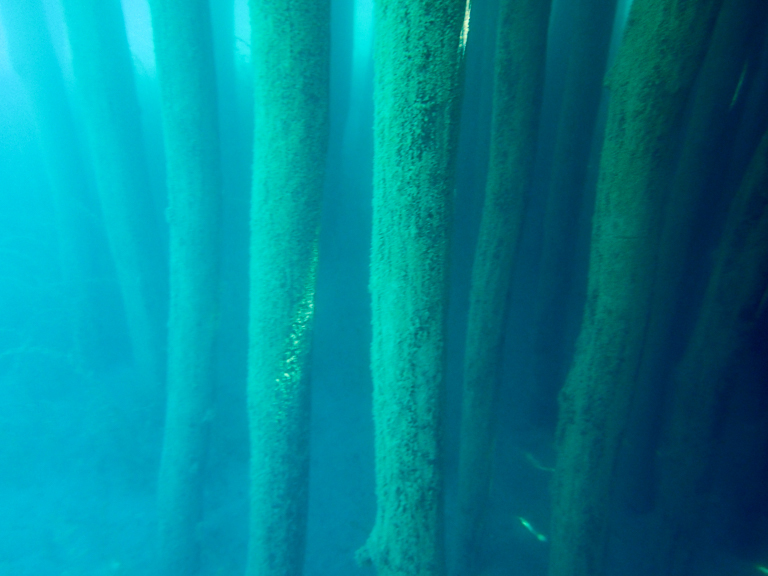 Archaeologists discovered numerous wooden piles at depths up to 5 meters (16 feet) that dated a period that overlapped the Bronze and Iron Ages. 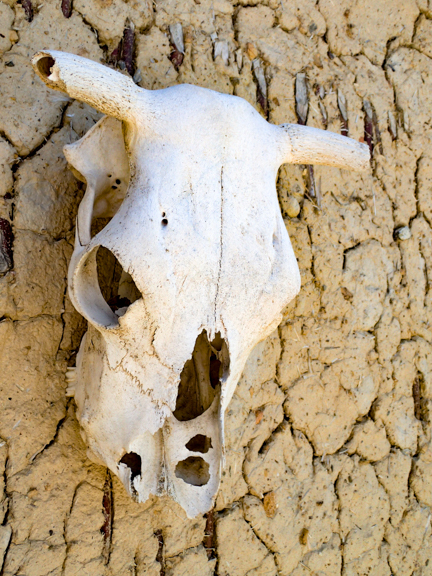 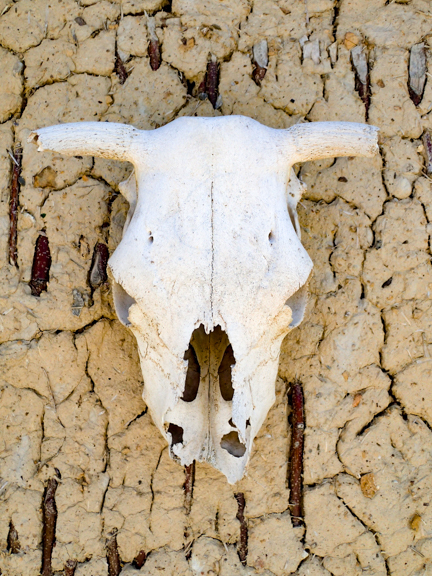 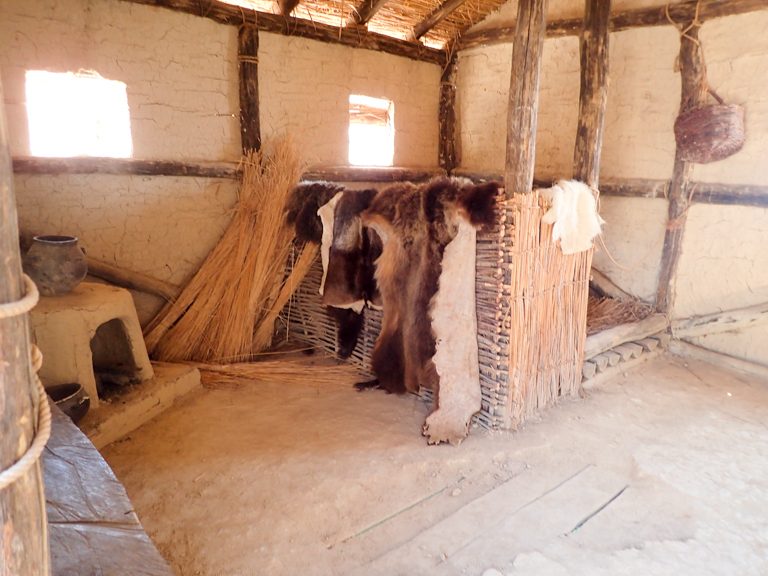 Also discovered were numerous animal bones (hence the name “Bay of the Bones”, ceramic vessels (some with handles), pots and stone artifacts.1 Some of these artifacts can be seen in the Museum built on the shore just across from the reconstructed pile dwelling settlement. 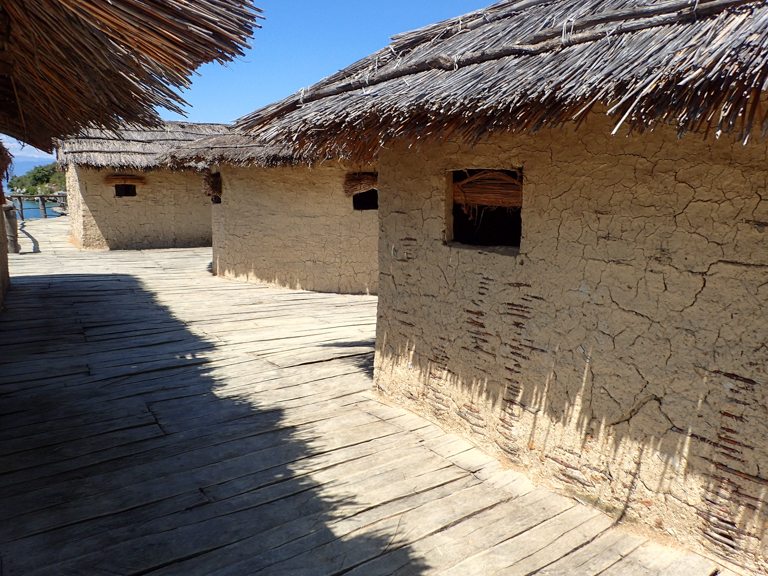 The surveying and investigative campaigns of 1997 and 2005 revealed over 6,000 wooden piles and the settlement had covered an area of 8,500 square meters (91, 493 square feet or 2.4 acres). 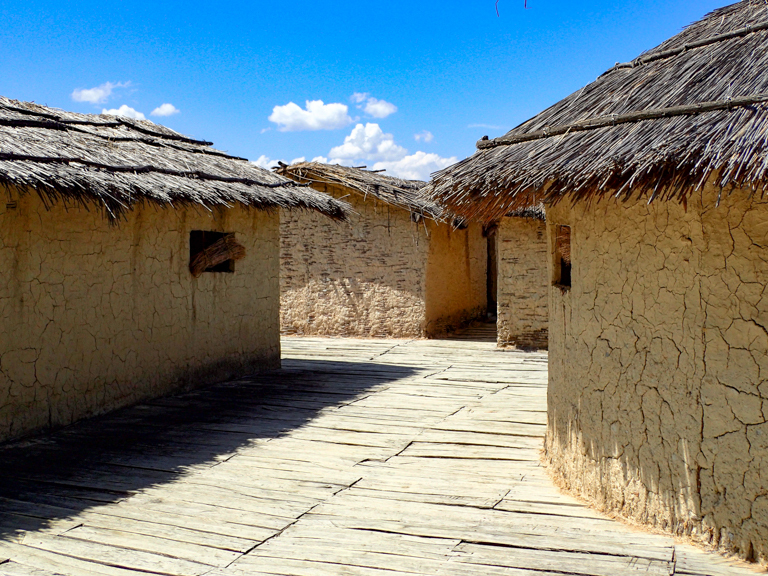 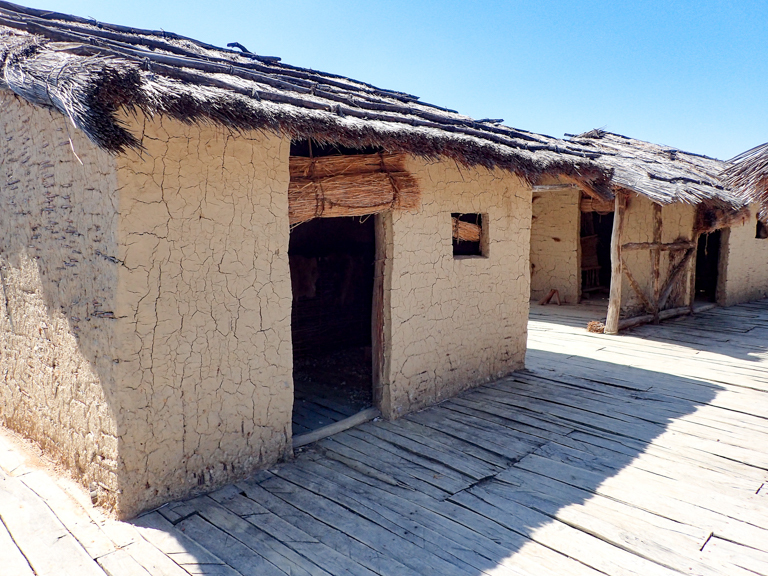 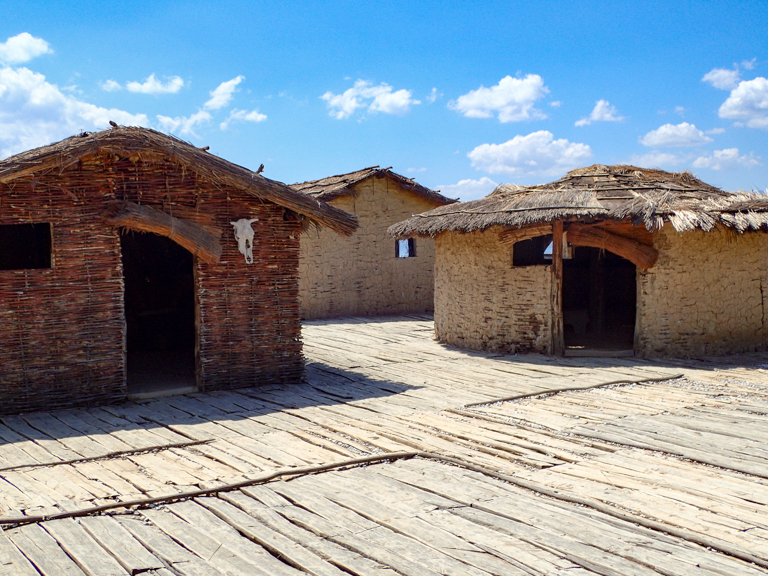 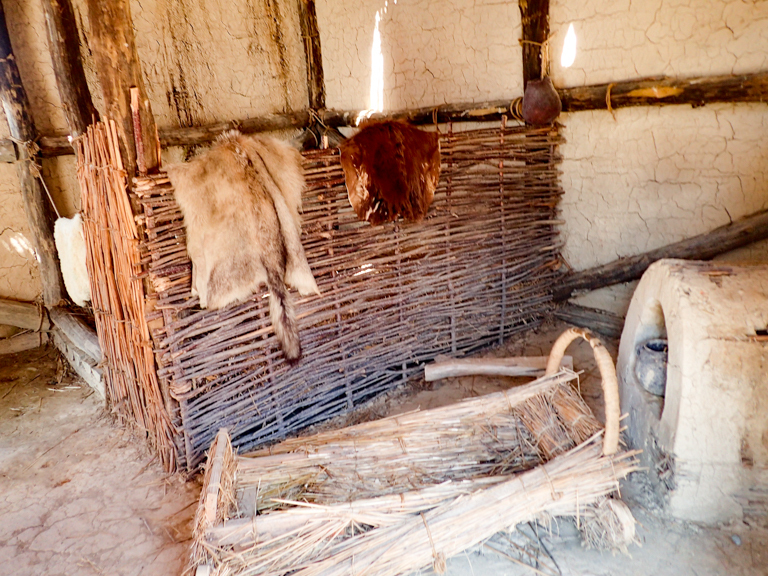 The pile dwelling settlement that was reconstructed over the original prehistoric settlement features 24 prehistoric homes. 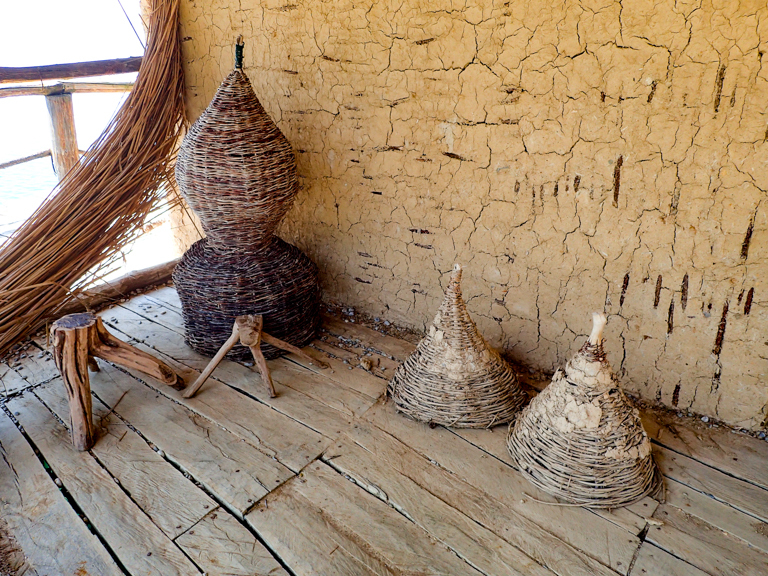 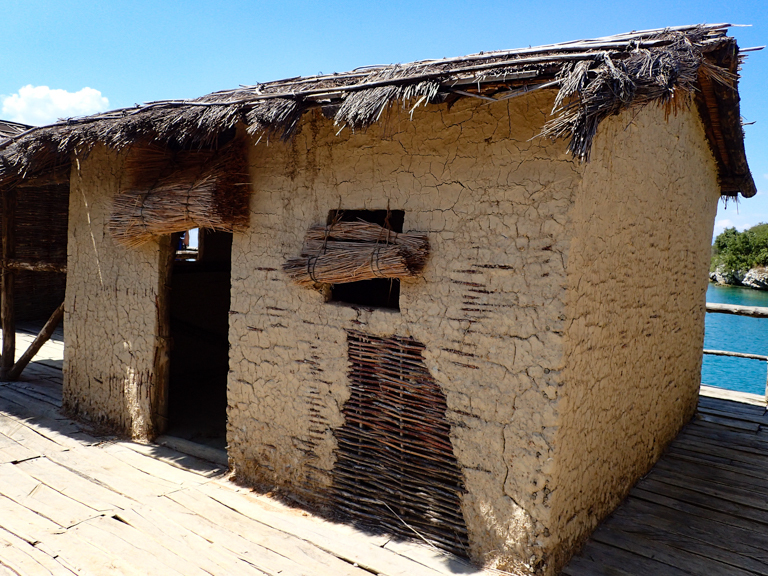 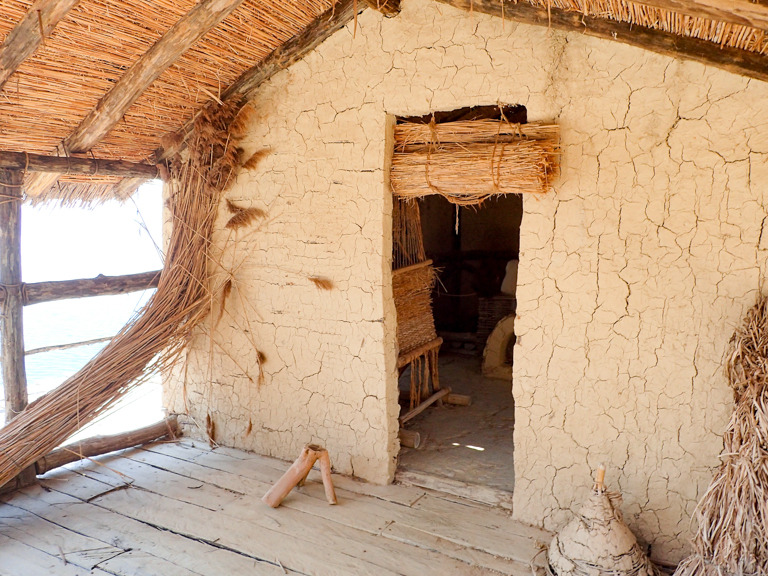 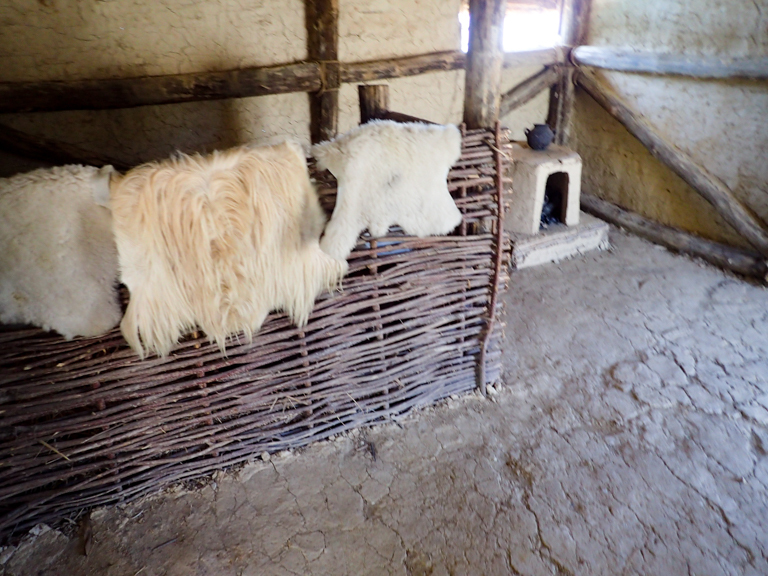 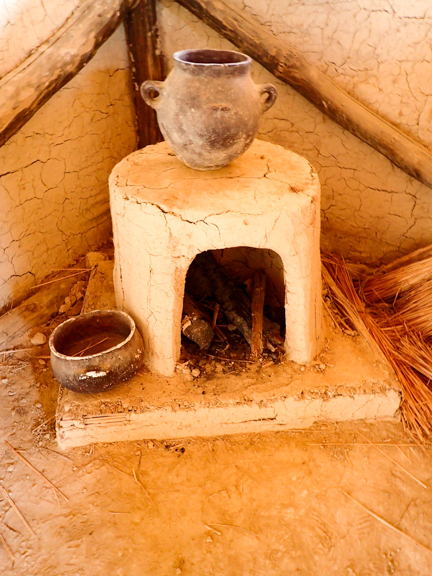 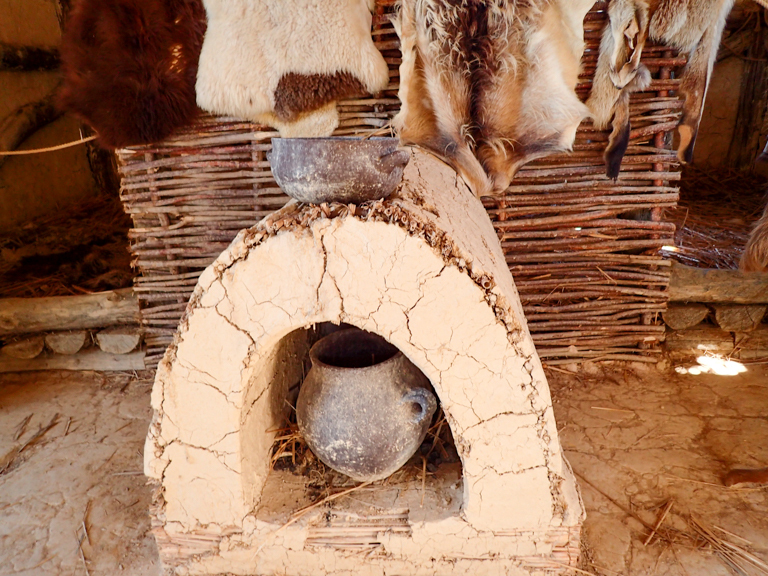 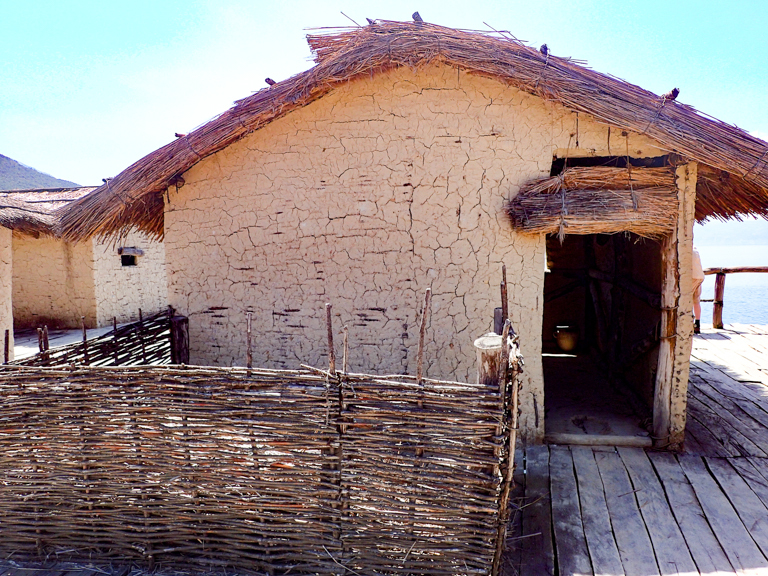 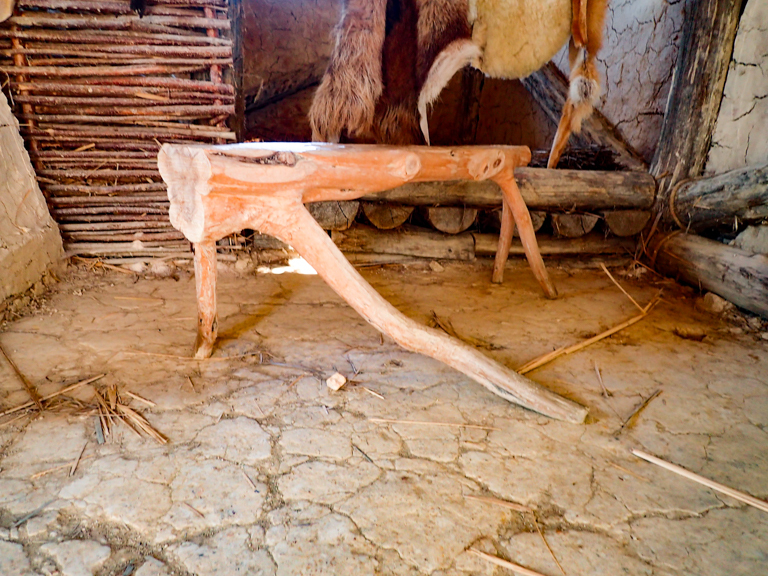 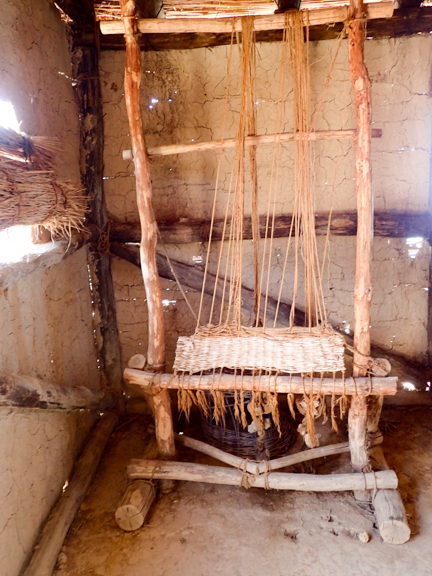 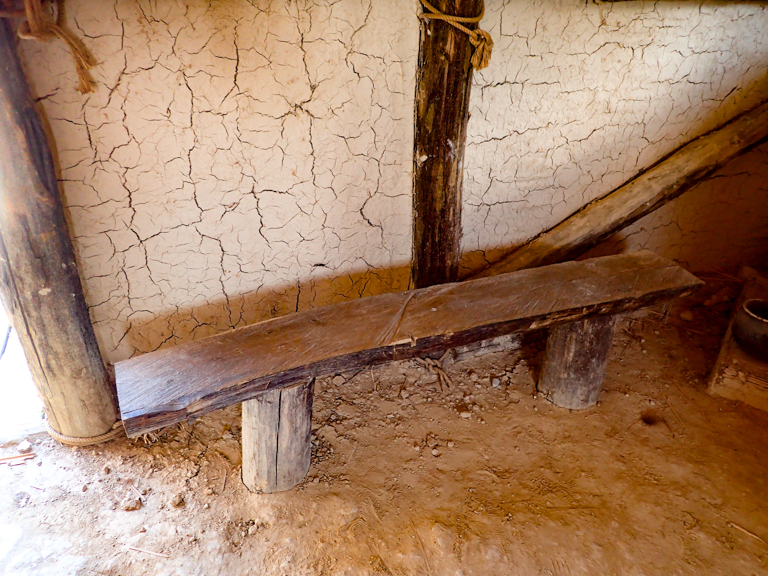 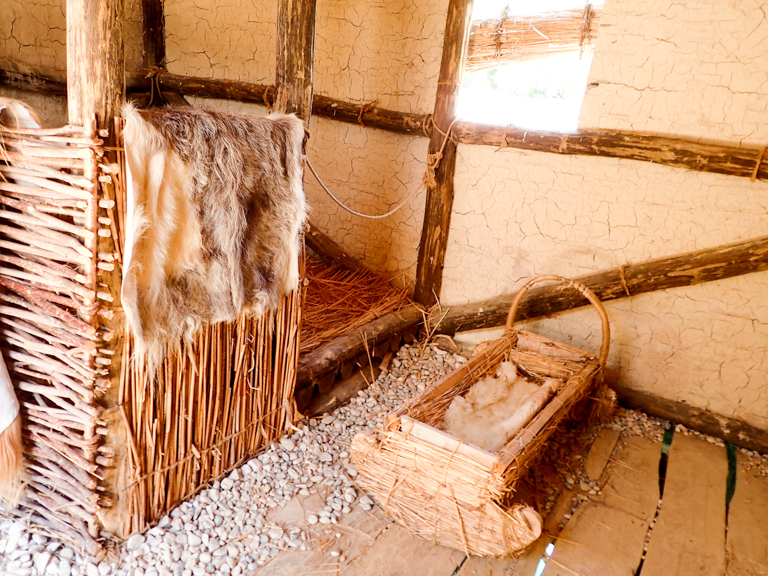 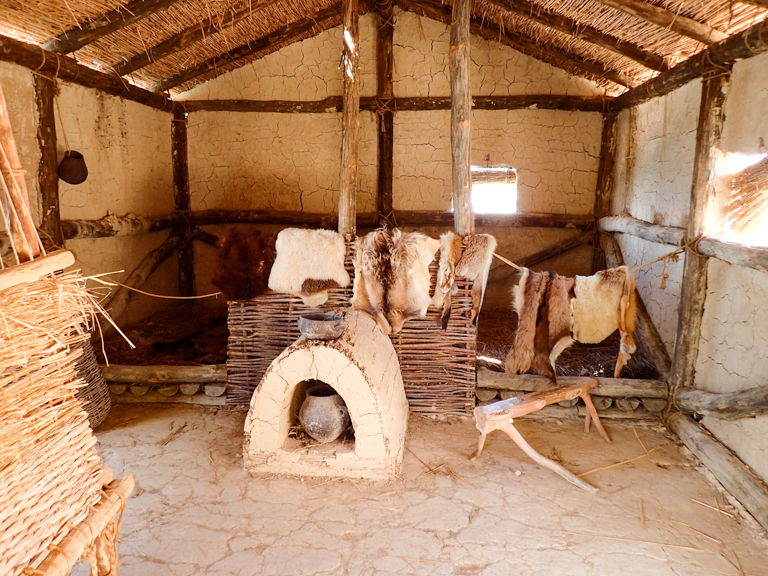 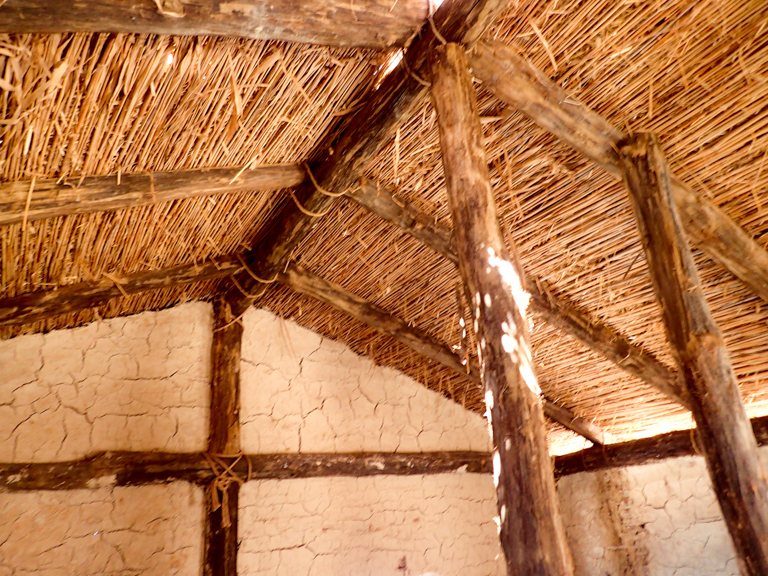 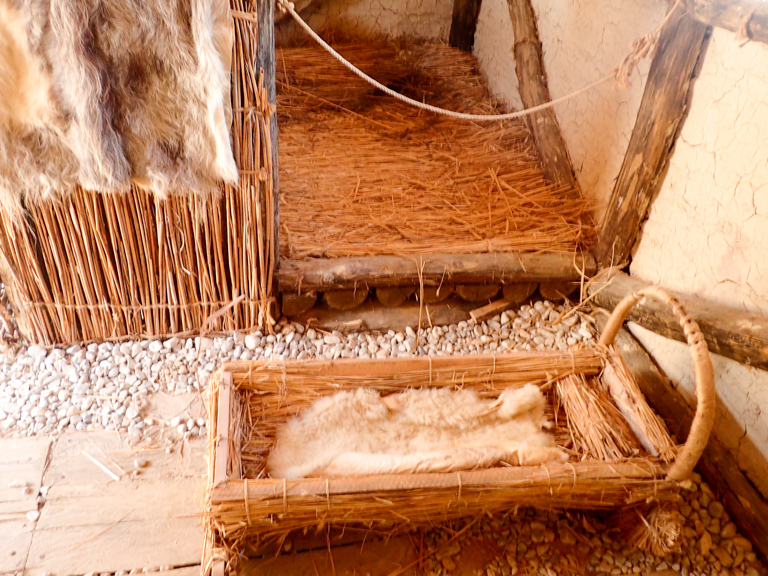 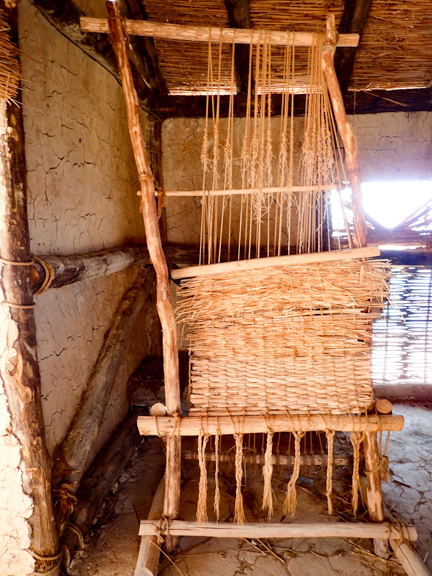 Inside each home you can observe the tools, cooking and sleeping arrangements indicative of the Bronze and Iron Ages. 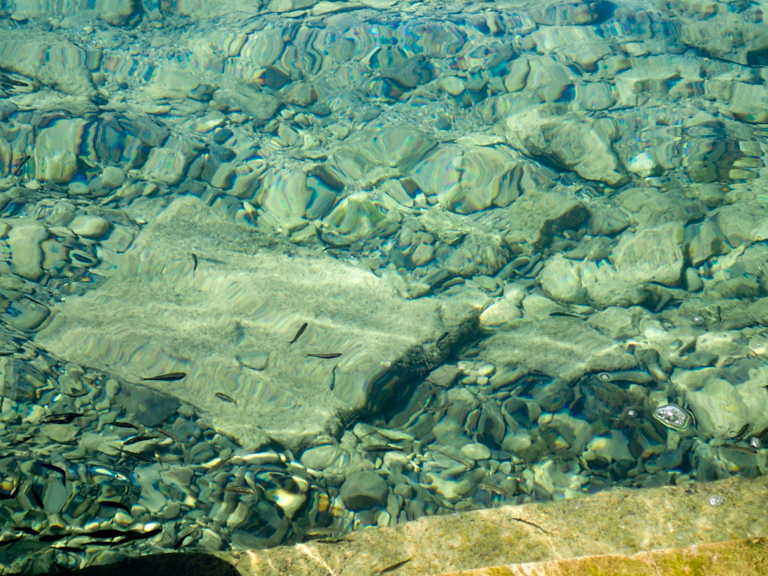 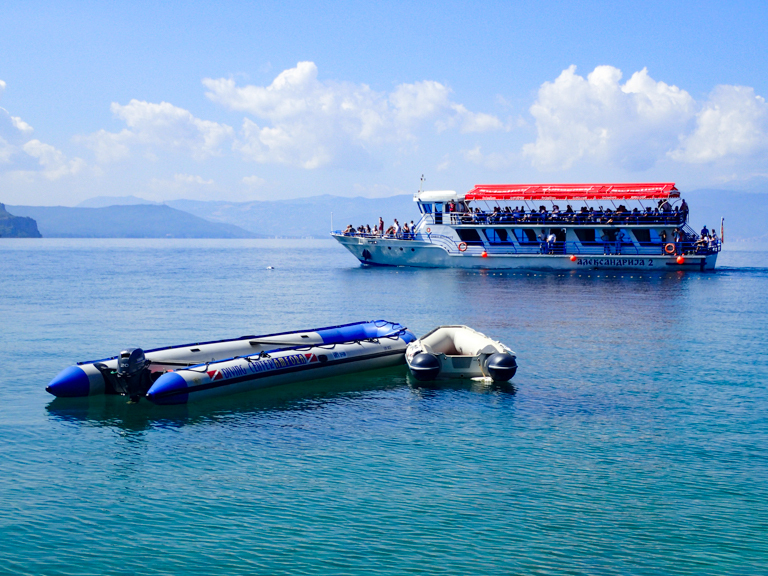 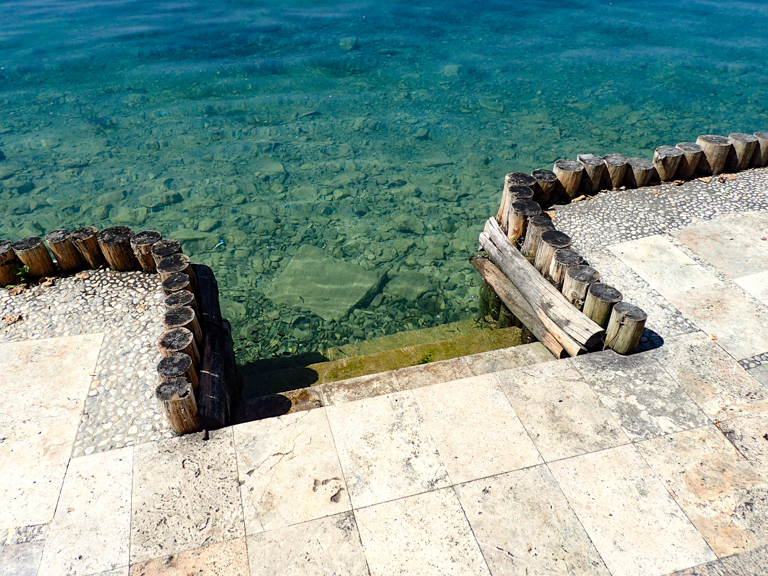 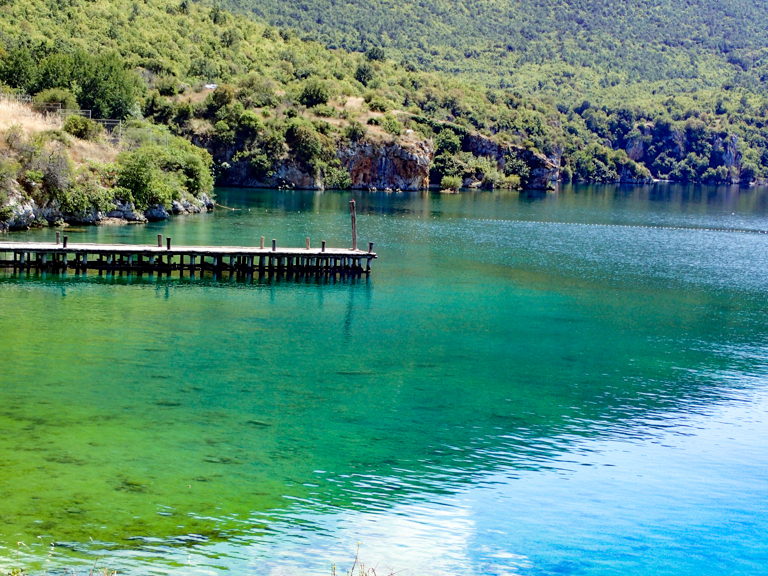 In addition to the pile dwelling settlement in this picturesque bay, museum and café, you can also go scuba diving. 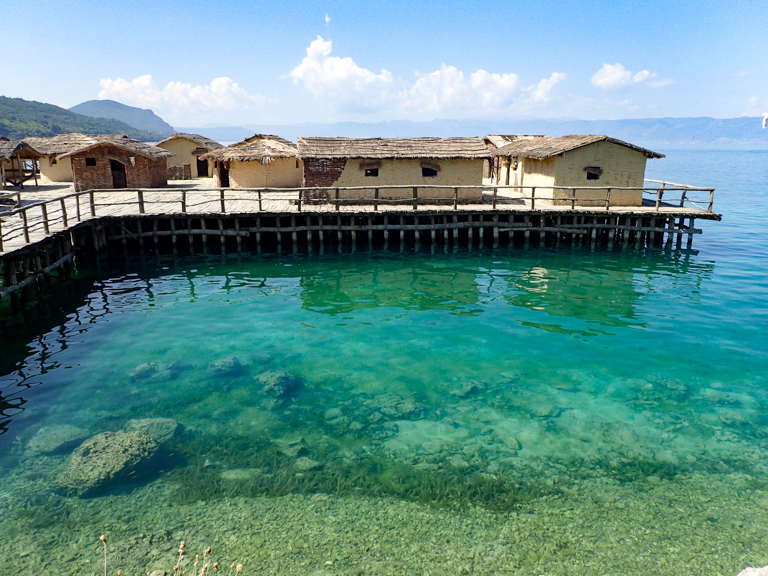 Also located in the bay is the Amfora Diving Center, where you can rent equipment, take a beginner’s course or even get certified. 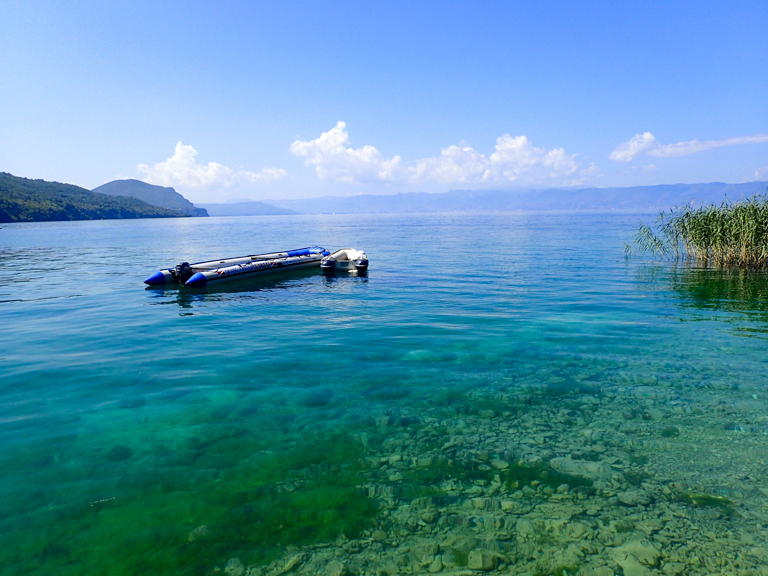 We sat through a re-orientation as it had been a while since we last dived, and then followed the instructors for a dive in the bay and exploring the piles! 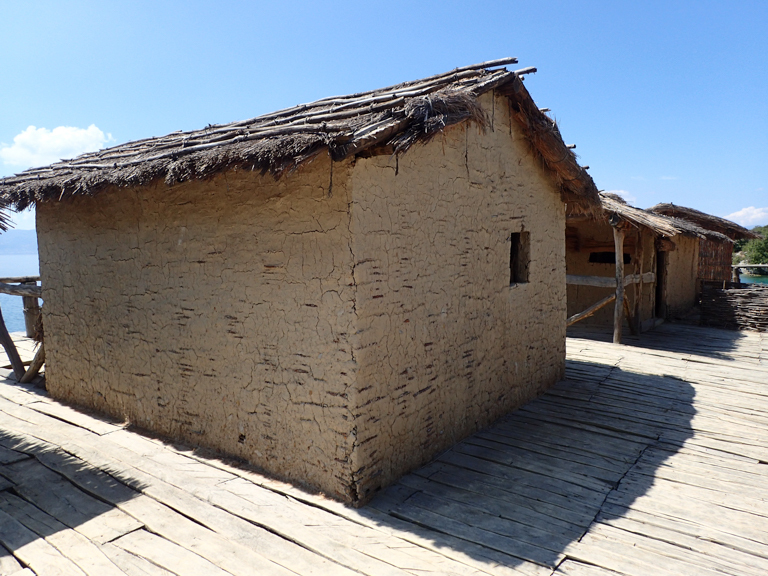 For more information click on http://www.amfora.com.mk/index.php?lang=en.